The date of birth refers to a generation timescale, used here as a theoretical scaffold, of 27 years divided into three-year spans. The starting point is the assumption that Ælle was about 63 when he died, allegedly in AD 514. Please note that quite apart from the genealogical theory of this hypothesis, a certain amount of documented history and remembered tradition has been modified by conjectural input as well. This has been necessary to support the chain of events proposed here. Wherever possible, without overburdening the text, the reader has been alerted when this occurs. Firstly, the introduction is about the remembered tradition concerning the first ninety years of Sussex that might be identified as the Royal Legend of the South Saxons, although, with the exception of Ælle, most historians give no credence to what little has survived. Secondly, it is about how the aim has been pursued to establish an hypothesis on the lineage of their Sussex-based rulers who remain obscure, and, in so doing, offer a perspective other than the familiar blank canvas of South Saxon history. Sadly, the early story of Sussex lacks documentation, and even where the names of her later princes are known, any understanding of the relationship between them remains at best very limited. Establishing an hypothesis, therefore, is an attempt to give an alternative perspective by throwing a measure of conjectural light across the historical darkness. It is hoped that this quest may be useful to some of those who have an interest in the Anglo-Saxon kingdoms and their often forgotten formative influence. For example, based on the hypothesis, a theoretical timeline for Sussex or a genealogical table of her rulers could be drawn up, or it might be employed for a qualified and phrased historical comment, or as a basis for a more conclusive theory on why Sussex was divided into the rapes, and to discuss the origin of these ancient divisions of the old county. Tradition has held, and the Anglo-Saxon Chronicles have recorded, that Ælle landed from Gaul at Cymen's Shore in 477, with his three sons, Cymen, Wlencing and Cissa, and three keel-loads of warriors. There was a battle between the Saxons and the Welsh (that is, the "strangers" or Britons) at Mearcred's Burn (unidentified)  in 485, and six years later, in 491, Ælle conquered the coastal strip and captured the Roman fort at Pevensey with the aid of his youngest son Cissa. There is an old local tradition that the Britons made their last stand on Mount Cayburn which doubtless was once part of the legend. It was told that Ælle was the first Bretwalda, and it was also claimed that he was the first king of the South Saxons. 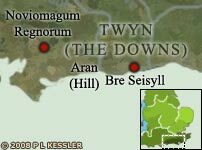 After Ælle's death in 514, his son Cissa followed him as king, making Noviomagum Regnorum his royal centre, renaming the Roman town Cissan Ceaster. 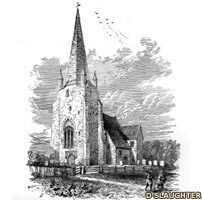 There is a remnant of this tradition, which survived locally, relating that his son Wincheling founded Winchelsea. Tradition also held that Cissa was still king 72 years after his reign began (perhaps referring originally to the death of an heir at this point), and that he eventually died in 590, after reigning for 76 years. Presumably, in a later period, Cissa was believed to have died at about the same age as the biblical Adam. 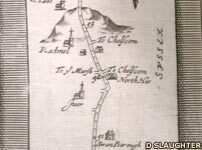 Part of a road map of Sussex, dating from the reign of George III, showing a road climbing over the South Downs near Lewes, a name which derives from the plural of 'law', Old English for hill. On Cissa's death, it was told, the kingdom of the South Saxons passed to Ceawlin, king of the West Saxons. This royal legend has only survived in fragments and, as it stands, has a number of difficulties. For one, the story of Cissa it is not feasible in terms of timescale. However, the remains of this oral tradition, identified here as the Royal Legend of the South Saxons, undoubtedly hides the historical truth, and it can be demonstrated that some of its narrative could prove feasible, if not verifiable, by a radical attempt to restructure the extant fragments. Plausibly interpreted to mean 'the stream of the agreed frontier'. It may therefore relate to a boundary based on one of the river valleys which serve to divide the Sussex coastal plain and its hinterland into naturally self-contained sections. It is known, because of the evidence found in Sussex place names, that the coast of the sub-Roman region formerly held by the Regni, sometimes referred to as Rhegin, was settled in the late fifth century by some forty chieftains, most of whom were likely to have risen from the ranks of the aristocratic warriors of the warlord, Ælle, and a blood relative called Wlenca (see the reconstruction hypothesis below). By comparing patronymic place names in Sussex in terms of Anglo-Saxon naming patterns, evidence might be found that amongst them there could have been kinsmen. Was the usurpation of sub-Roman Rhegin, and its transformation into a Germanic Sussex, an organised enterprise? It would have been during this period, near Mount Cayburn where the local British warriors made their last stand after the destruction of Pevensey, that South Malling was founded by a chieftain called Mealla. Mount Cayburn was not far from the destroyed Roman fort, and perhaps Mealla founded his settlement soon after the Cayburn battle which must followed the British loss of Pevensey. Moreover Mealla is a name easily compounded over time with Ælle (Malla>Ella). In line with Anglo-Saxon naming patterns amongst kinsman such as Nunna and Ine, and taking account of campaigning brothers like Ceawlin and Cutha, there would appear to be some circumstantial evidence here to propose the idea that Ælle was Mealla's elder bother. In which case, in terms of this hypothesis, it seems feasible that Mealla would have been one of the four alderman who landed near Selsey in 477, and that it was he who won the battle at Mount Cayburn. This radical conjecture to try and identify the other alderman who landed with Ælle in 477, since Cymen/Wlencing cannot be two separate people, provides a convenient example of how the quest for the lineage of South Saxon rulers has been pursued. The conjecture is also an example of how the Royal Legend of the South Saxons can be restructured. The entry for Mealla can be found below. Thus, an attempt has been made to reconstruct hypothetically the regnal history of the South Saxons, starting at its genesis through to its demise at the hand of the Mercians in 772, and concluding with the period of the last South Saxon sub-kings, or dukes. The endeavour has been to achieve this by using history as the framework for informed conjecture to establish a theoretical genealogy. The main reference material which was employed to assist this process is listed in the bibliography at the end of the article. The tower of Chiddingly church. The name probably meant 'Cidda's meadow'. If Cilta and Cidda were the king's brothers, then the similarity of these names to Cissa may have contributed to their being forgotten. 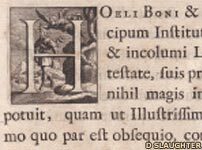 The H of Hoeli in the opening lines addressed to Frederick Louis, Prince of Wales, presenting to him the Laws of King Hywel, in Latin and Welsh, in 1730. This volume contains laws that were in common between Britons and Saxons. Further, as has been clarified below, it would seem reasonable to believe that the kingdom of the South Saxons became extinct under the military power of Wessex during the late sixth century, and not that the South Saxon kingdom was lost to the Britons in the decades which followed the decisive British victory over Ælle, and his ally the Kentish Aesc, at Mount Badon in 493 (the uncertain date given by Bede) . Nevertheless, the defeat of Ælle's Saxons halted any advance they might have intended to make for westward settlement and greater tribal power. The reconstruction hypothesis follows in six sections over four pages. The date used for Mount Badon throughout the rest of the History Files is AD 496.